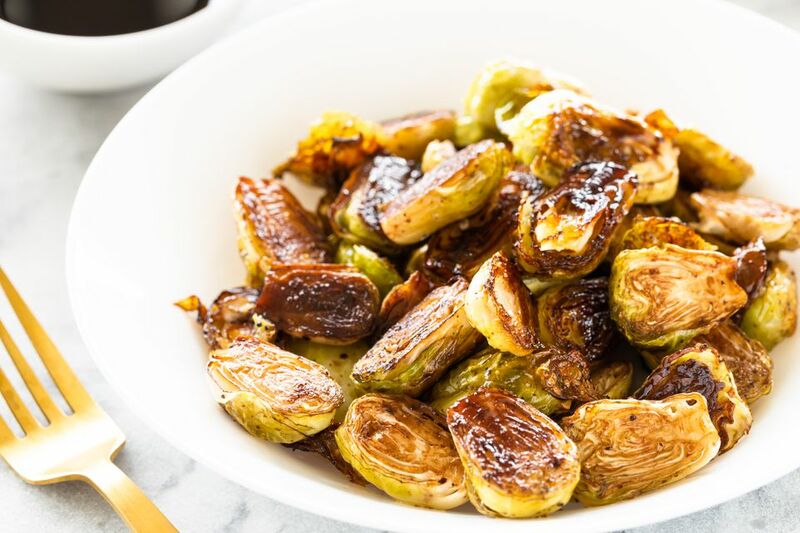 Enjoy this quick-and-easy vegetable side dish recipe of oven-roasted Brussels sprouts with balsamic vinegar and olive oil, lightly seasoned with salt and pepper. This recipe is vegetarian, vegan, and gluten-free and a popular easy Thanksgiving recipe. This is one of those recipes (like so many) that requires sea salt or kosher salt rather than regular table salt, and you absolutely must use fresh ground black pepper as well. Why sea salt or kosher salt? Kosher salt dissolves fast and disperses its flavor throughout food quickly, while sea salt contributes different flavor notes depending on the minerals it contains. These Brussels sprouts are a crowd-pleaser that will have your family and friends raving about what a gourmet chef you've become. Just don't let on how simple it is! If you're looking for more vegetable dishes or side dishes to try to round out a meat-free vegetarian or vegan Thanksgiving or Christmas menu, you might want to browse these simple holiday vegetable side dish ideas. Give Brussels sprouts a rinse in cold water and dry in a paper towel. Trim off the ends if the sprouts are large and firm. If they are more tender, trim the end just a tiny bit. Pull off any loose outer leaves. Slice in half, lengthwise and set aside. In a small bowl, whisk together salt, pepper, and vinegar. Using a whisk, slowly drizzle in the olive oil until mixed. Place the Brussels sprouts in a single layer on a foil-lined baking sheet. Drizzle the oil and vinegar dressing over the sprouts (reserving a little for serving) and gently toss to coat. Bake in the oven for 25 minutes, turning once. Sprouts are done when they are lightly browned. Serve the Brussels sprouts with an extra drizzle of the dressing if you wish, but they are also delicious just as they are from the oven. After the Brussels sprouts have finished roasting, transfer to a bowl and toss with 1 teaspoon honey. Serve hot. Add a squeeze of fresh lemon juice to the roasted sprouts to brighten the flavor. Mix in chopped fresh herbs to the sprouts before roasting. Toss the roasted Brussels sprouts with toasted pine nuts and dairy-free Parmesan cheese. Turn your roasted sprouts into a salad by mixing them with minced garlic, halved cherry tomatoes, and 1-inch pieces of raw or blanched asparagus. Add more dressing, if desired, and chill until cold. Serve them speared with a toothpick and a side of mustard as an appetizer. Most people have been introduced to Brussels sprouts after they have been boiled which brings out an unpleasant aroma and the yucky taste of overcooked cabbage. Roasting them, on the other hand, brings out their natural sweetness by caramelizing the sugar they contain. But even roasting can't rescue sprouts that have lingered in your refrigerator for weeks. Remember, the fresher the sprout, the sweeter the taste.